This main dish salad hits all the right notes - grilled steak, marinated mushrooms and peppers, red onions and tangy goat cheese served on top of crisp salad greens. 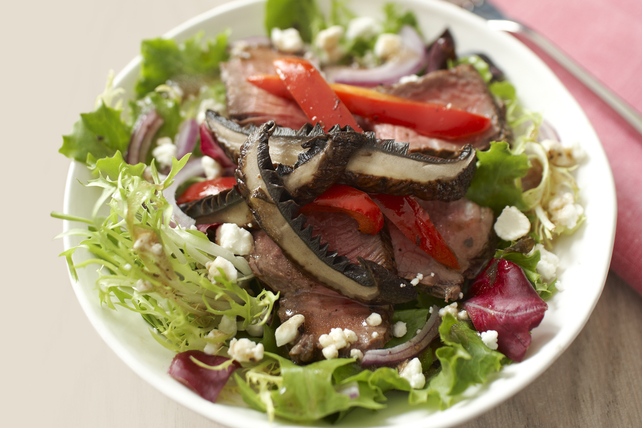 This Sizzling Sirloin and Portobello Salad is a restaurant favourite, made easily at home. Preheat barbecue to medium-high heat. Reserve 1/4 cup of the dressing; set aside. Brush remaining dressing onto outsides of mushrooms, peppers and one side of the steak. Grill mushrooms, peppers and steak, dressing-sides down, 10 min. or until steak is medium doneness (160ºF) and vegetables are crisp-tender, turning after 5 min. Meanwhile, cover four serving plates with greens, then top with onions and cheese. Cut steak across the grain into thin slices; cut mushrooms and peppers into strips. Top salads with the meat and vegetables. Drizzle with the reserved 1/4 cup dressing. Serve with half of a multigrain baguette, sliced and 1/4 cup Kraft Extra Virgin Olive Oil Aged Balsamic Vinaigrette Dressing for dipping. For a milder cheese, substitute marinated cream cheese for the goat cheese. To prepare cream cheese, pour 1/4 cup Kraft Extra Virgin Olive Oil Aged Balsamic Vinaigrette Dressing over 125 g (1/2 of 250-g pkg.) cubed Philadelphia Brick Cream Cheese in shallow glass dish; cover. Refrigerate at least 30 min. to marinate. Remove cheese from marinade; discard marinade. The red peppers in this tasty salad provide an excellent source of both vitamins A and C.